Mention climate change and you’ll get hot responses from some conservatives who believe the risk is falsified, earth’s temperatures are not rising, satellite data is fudged and human-made CO2 and methane don’t absorb heat from the sun. 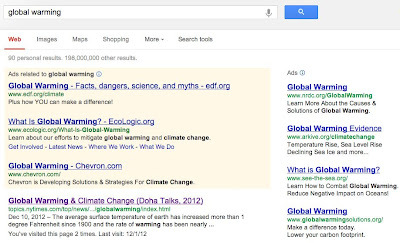 Some liberals leap far the other way, accusing energy giants such as ExxonMobil of mendacious disinformation campaigns bent on disguising global warming. Climate change is one of those issues that, like the fiscal cliff in Congress, leads to more finger-pointing than problem-solving, with each debate participant letting his or her worldview color the facts. Chevron has its own strategy: cut through the denial and talk straight about the issue. 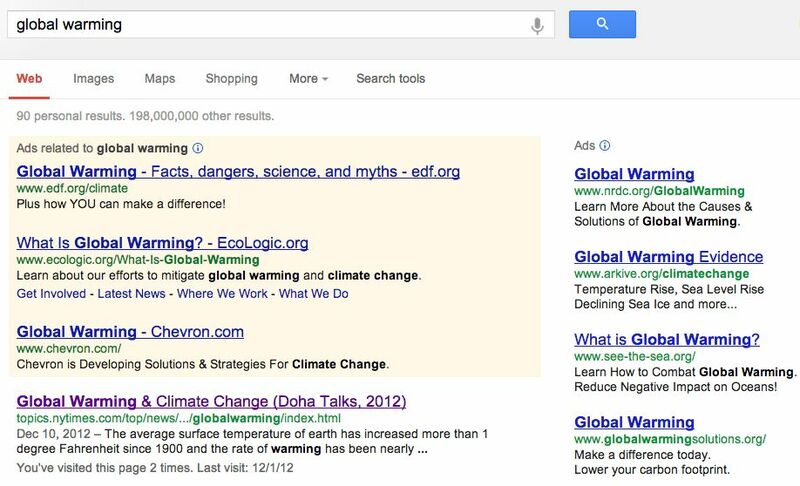 And of course running ads inside Google searches for “global warming” means you’ll only be talking to people hunting for the issue, in essence partitioning off environmentalists with their own communication stream. But I don’t think that’s it. Chevron’s main tagline is now “The Power of Human Energy: Finding Newer, Cleaner Ways to Power the World.” ExxonMobil by comparison offers the comparatively bland “Taking On the World’s Toughest Energy Challenges.” Chevron is becoming the 7Up to ExxonMobil’s big cola. It’s a crisp, clean, different alternative — explaining that energy is not good or bad, but rather an evolving spectrum, headed for cleaner solutions. Chevron is focused on a multi-billion-dollar emerging energy market. At least for branding, that’s a warm story.